Being part of a generation that grew up with his voices as part of our lives, it’s only fitting that on anniversary of his death we celebrate the extraordinary talent of “The Man Of 1000 Voices”. Great talents seem to embody their craft. It’s as if they invented the form and then broke the mold when they were finished with it. 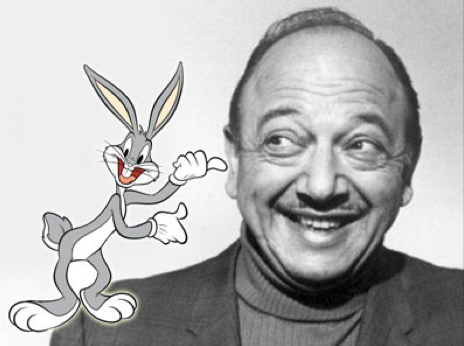 One of the best modern examples of this virtuosity is Mel Blanc, voice of Bugs Bunny and nearly all of the Looney Tunes cartoon gang. Blanc, who voiced more than 1,000 characters, was famously hard-working. At one point in his career, he scrambled from studio to studio around Los Angeles to work on 18 radio shows in one week. Old fashion commentators like to say, that kind of practice leads to mastery. 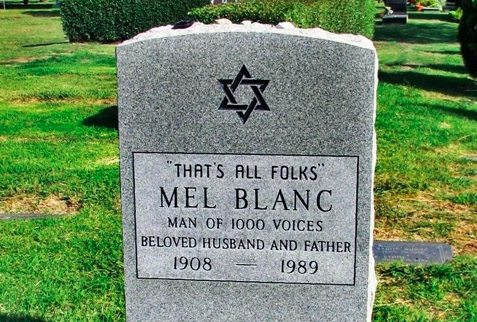 And, in Mel Blanc’s case, it may have saved his life. Radio Lab, broadcast over WNYC, recently aired a piece about Blanc (listen below) featuring an interview with his son Noel Blanc, who is also a voice actor. Noel Blanc tells the story of a terrible car accident that badly injured his father in 1961 as he was driving home along Sunset Boulevard from a job in San Francisco. Mel Blanc, driving an Aston Martin, collided with another car on Dead Man’s Curve. Blanc was almost killed and slipped into a coma. Blanc’s son and wife spent two weeks at his bedside trying to revive him, but got no response. There was a pause while people in the room just shook their heads. Then, in a weak voice, came the response anyone would recognize. The doctor then asked Tweety if he was there too. “I tot I taw a puddy tat,” was the reply. It took seven more months in a body cast for Blanc to recover. He even voiced Barney Rubble in the first episodes of The Flintstones while lying in bed with a microphone dangling from above. The Radio Lab piece includes excerpts from an episode of This is Your Life when Blanc’s doctor tried to explain how he revived his patient. “It seemed like Bugs Bunny was trying to save his life,” was all he could say. Radio Lab features another neurologist’s opinion: Blanc was such a hard-working professional that his characters lived, protected from the brain injury, deep in his unconscious mind. The doctor’s question must have sounded like a director’s cue. And he was, until 1989. Radiolab – What’s Up, Doc? 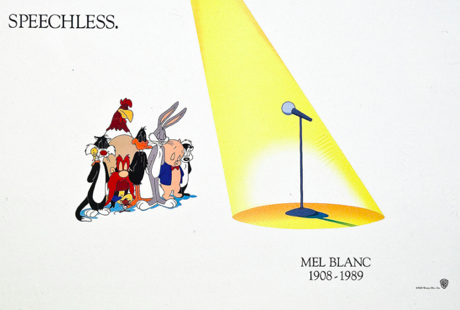 Melvin Jerome “Mel” Blanc (May 30, 1908 — July 10, 1989), a.k.a. 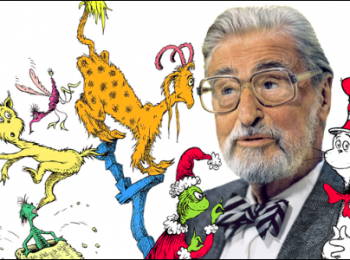 “The Man of a Thousand Voices”, was one of the most prolific voice actors of all time, as well as one of the best. Originally working in commercials and radio shows, Blanc was hired by Warner Bros. in the late 1930s to do voices for cartoons. And the rest as the say is history. Blanc is most notable for voicing most of the cast of Looney Tunes (among other cartoons), which frequently saw him Talking to Himself. What’s amazing is that most people probably wouldn’t be able to tell that, most, if not all, of the characters in each Looney Tunes short were being done by the same guy (Leonard Maltin once put his talent into perspective by marveling that Tweety Bird and Yosemite Sam were the same man). He was that good. It even got to the point that his knack for doing many voices was lampshaded in the Porky Pig short Curtain Razor. He was also one of the only voice actors in his day to ever get a credit for his work in any theatrical shorts. Blanc was also something of a Humble Hero, calling himself “the male June Foray,” a rarity in a time when no one would have criticized or even thought twice about ignoring the accomplishments of women around him. Needless to say, Blanc is a legend among voice actors and fans. His voice work is considered the milestone that marks the Golden Age of animated comedy, and his characters’ catchphrases are still remembered nearly a half-century later. It ought to also be remembered that Blanc essentially won voice actors the honor of being credited cast members. He had become so indispensable to Leon Schlesinger’s studio that the only way the cheapskate could avoid giving into Blanc’s demands for a raise was to guarantee him sole on-screen credit as a voice actor, which gave Blanc the notability to be sought after for work by name. Later, other voice actors followed suit, and within a few years it was unthinkable to not credit a voice actor. Bugs Bunny- He even chewed raw carrots to get the sound right… an immediately spat them back out, as he couldn’t swallow them fast enough, since he hated the taste of carrots. He admits in his autobiography, “That’s Not All, Folks”. that they tried a myriad of other vegetables for him to crunch, but unfortunately nothing else sounds like a carrot. In 1961, Blanc had a case of “I Am Spock” after a near-fatal car accident which left him in a coma for three weeks. After many attempts to wake him up from his coma, a doctor thought of saying, “How are you today, Bugs Bunny?” at which point he replied (obviously, in Bugs Bunny’s voice) and went on to have a full recovery. Daffy Duck- Basically, this was just his voice for Sylvester the Cat sped up. Porky Pig – his first major role, as well as one of his last. Originated by Joe Dougherty (who actually had a stutter which was hard to control); Blanc replaced him in 1937. Pepe Le Pew – based on French actor, Charles Boyer (though thanks to Blanc’s take on Boyer for Pepe Le Pew, many generations wouldn’t know that). Sylvester the Cat – The character who sounds the closest to Blanc in real life. It was slightly exaggerated and a lisp was added. Yosemite Sam- One of two of his classic characters he didn’t portray in Who Frames Roger Rabbit because his voice was too weak to handle Sam’s gruffness. There was also an extended Foghorn Leghorn sequence cut from the film which was done by Joe Alaskey, at Blanc’s request. Elmer Fudd- Actually, Blanc was not the regular voice of Elmer Fudd. Elmer’s actor was one Arthur Q. Bryan, who was just about the only actor besides Blanc (excepting occasional guest voices) to ever contribute to the Looney Tunes canon. Woody Woodpecker: He briefly voiced the character in his first three cartoons, but was immediately forced to step down from the role once he gained an exclusive contract for the Looney Tunes series—but the famous Rat-A-Tat laugh that he gave Woody would be recycled well up into the 1950’s, even after Woody found other actors. Most curiously, Woody’s very first line in “Knock Knock” is Mel Blanc’s normal speaking voice, which is not sped up at all. Barney Rubble While Sylvester was closest to Blanc’s normal speaking voice, Barney got Mel’s laugh, just a bit more forceful (Daws Butler voiced Barney Rubble when Blanc was in the hospital. One episode even had Barney’s voice change from Daws Butler’s to Blanc’s right in the middle of the episode). Spacely- also very close to his real voice (and sounds similar to Yosemite Sam’s when he gets angry). His final performance before his death was for Jetsons: The Movie. Heathcliff- his last “new” character, first assumed in 1980 (more than four decades after his debut as a voice actor). A number of minor characters on The Jack Benny Programme, including Jack’s parrot, Jack’s polar bear, and Jack’s car. Twiki on Buck Rodgers in then25th Century. And a whole lot more, including a number of secondary and one-time characters.